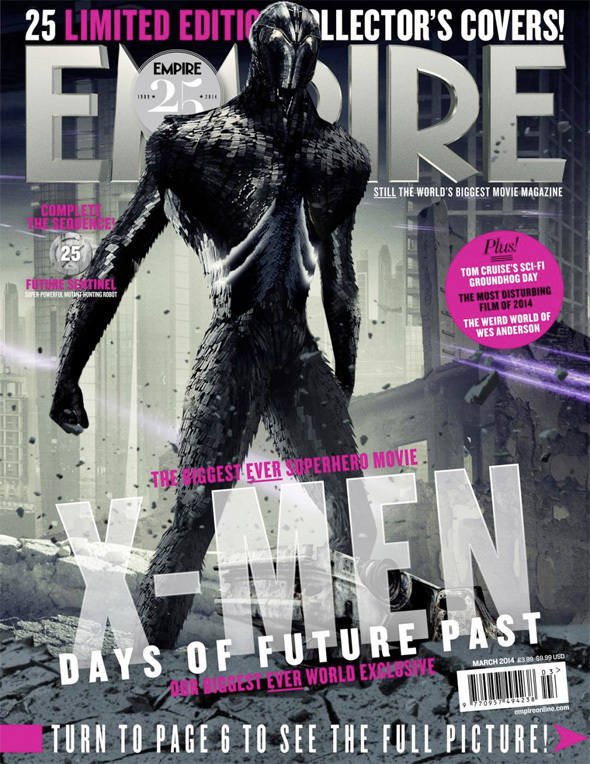 Yesterday, we continually posted the magazine covers from Empire promoting the forthcoming summer release of X-Men: Days of Future Past. There are 25 total covers, but when the final one was revealed, we decided to separate it from the pack. Why? Because it's our first look at the sentinels of the future wreaking havoc on Patrick Stewart, Ian McKellen, Hugh Jackman and the rest of the X-Men originated by director Bryan Singer. They certainly don't look much like the retro design we've seen from Trask Industries, and have an almost surreal quality about them. Anyway, in addition we've also included a glimpse at the full panorama shot that is created when all of the magazine covers are put side-by-side. Look! "They're biomechanical weapons. We had to come up with what would be the ultimate version that could actually, in principle, stop the X-Men. We started with this idea that they were almost made up of magnetic plates slapped over one another, imagining that the plates could contract or grow, so the Sentinel can be skinny to get through a small space or the plates can open up to become a bigger shape. So they have become virtually unstoppable." I kind of wished they just forgot about the "present day cast" and just continued with the First Class ensemble. Admittedly, I'm not a Comic Book Guy so I'm only speaking as a casual fan but I thought First Class got everything right and very much improved upon the previous films. As a comic book fan, i still agree with you. All X-men and all Wolverine movies are garbage. Only liked Matthew Vaughn's interpretation as that fit the most. I disagree. Mangold's take on Wolverine was actually really impressive, sans the ending. How come MacAvoy is standing up? Guess we'll have to see the film to find out! Well if the aim of these photos was to disappoint, they nailed it. At this point I think it may be wise to prep yourselves for this movie to be bad. I'm not saying it WILL be but from these covers and what little I have seen my gut tells me we have another "X-Men:Last Stand" on our hands. Hope I'm wrong. I concur. Aside from the bad design, they also look like malnourished robots. The sentinels.... Quicksilver... Wtf.... That's it I'm out. And you thought the X-Men First Class Photoshop was bad... this wreaks! This ought to be epic. If this movie has been said to basically erase the events of the The Last Stand... why haven't they brought Cyclops back, he's this forgotten character now, even though he is technically the leader of the X-Men. Not Wolverine, like all the films make it seem. I'd think they'd bring him into the film somehow, considering all the time travel. I'm still holding out that his return will be a surprise. This is getting a lot of HYPE! I liked the obvious first few Xmen movies (NO X3). I am starting to think that they maybe shouldve went in a different direction. Maybe just picked up on what happened right after 1st Class. This could be too much too soon. I am excited and scared at the same time. If this movie sux, then Apocalypse won't get a chance.